If you are an IT Support staff member or the SQL server is running on a network, it is possible to define more controls on the port used by the SQL server. The instructions in Enabling TCP/IP in the SQL Server and Windows services SQL Server (SMTKINGDOM) and SQL Server Browser Are Running will enable TCP/IP on an arbitrary port. Insight will talk to the SQL Server Browser to determine the correct port. Hence, the user does not need to know the port. However, you can enforce more controls over the port used by the SQL server in the following steps. 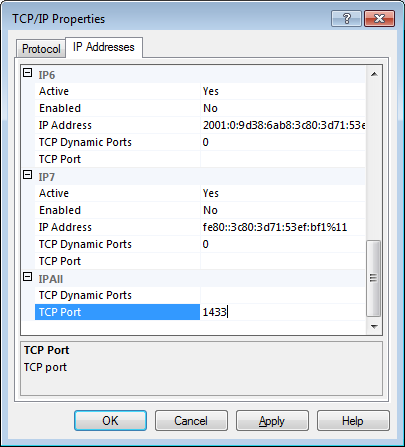 In the right pane, right-click TCP/IP and click Properties. This will open the TCP/IP Properties window. Scroll all the way to the bottom, type the desired port at TCP Port under IPAll. 1433 is a good option if available, as it is the default SQL Server port. If a different port is selected, users will need to fill out the Port field in Insight (see Switching to SQL Database from Access Database) to successfully connect — unless the SQL Server Browser is also running on the machine and communication on UDP port 1434 is allowed. Note: Disabling the SQL Server Browser or blocking UDP port 1434 may result in a delay while Insight connects to the Kingdom project.